Officials stated the spill occurred when the company employees attempted to transfer a newly delivered batch of hydrochloric acid. The hydrochloric acid turned out to be stronger than usual, which caused a violent reaction with the pump. DEEP spokesman, Dwayne Gardner, stated the acid “reacted violently with the pump” during the transfer process. State Department of Energy and Environmental Protection officials stated that twelve (12) to fourteen (14) employees were inside the building and were evacuated as a precaution. Gardner stated, workers immediately stopped the transfer of the flammable materials storage and closed the acid container. The transfer of flammable materials storage can be very dangerous and necessary precautions must be met before handling, storing or transferring flammable liquids inside an occupied facility or outside a facility. After closing of the flammable acid container, the manufacturer and distribution company was contacted to find out the exact composition of the batch. Customize your transfer locker with the most trusted chemical storage manufacturer nationwide and internationally. 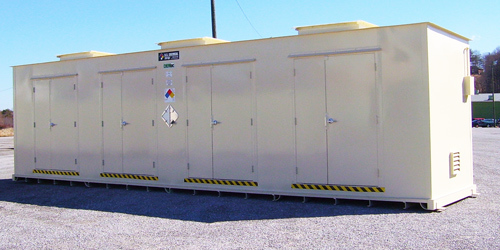 US Chemical Storage provides compliant, secure and extremely strong transfer lockers to protect people, investments and the environment. All of our transfer lockers are 100% customizable and 100% compliant. Continuously hand-welded in the USA for high quality construction. Contain your flammable materials storage inside your facility with a fire rated storage building by US Chemical Storage. Choose from our 2 hour or 4 hour fire rated transfer lockers to keep your flammables stored compliantly, inside your facility. All of our buildings are pre-tested before leaving the factory to maintain a completely sealed construction. Maintain your flammable materials storage with our wide variety of customizable accessories. Including but not limited to mechanical ventilation, exhaust systems, cooling systems, fire suppression, gas sensors, alarms, flooring and more. Contact one of our experienced sales engineers to find out how our transfer locker can keep your flammable materials storage fully compliant.